In the Crossfire: More jobs please! 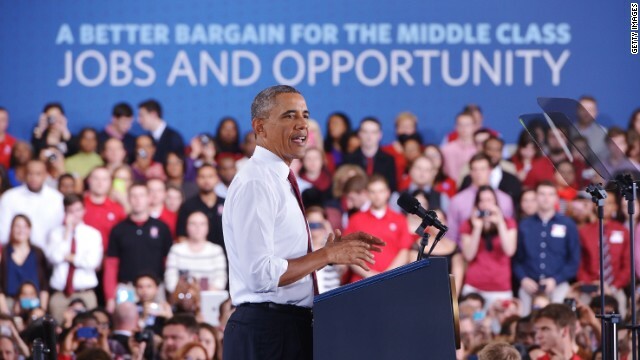 President Barack Obama traveled to North Carolina today to announce another bid to revive America's manufacturing sector, a first step in his newly imposed "year of action" that avoids Congressional approval for measures to boost the economy. Read the full story here. But how do we get this economy moving faster? What is the best prescription for job creation? At 6:30pm ET. Fmr. Labor Secretary Robert Reich and former Gov. Tim Pawlenty (R-MN) join S.E. Cupp and Stephanie Cutter to debate the economy. We want you to weigh in: Can Washington do anything to improve the economy this year? there has never been any serious Federal Jobs stimulus effort. Any 'jobs' (walmart-ish, fast food prep, etc....) that may have been fostered, have been fostered by state governments. I believe Democrats who wanted a very progressive Dem President are aghast & dismayed by B Obama. And Congress is even more appalling. LOL - It is always funny when Republicans from gerrymandered districts pretend to speak for "All Americans" and when others "feel" they know what "very progressive democrats" think. The only thing I am "aghast & dismayed" at is the willingness of so many voters to be hornswaggled into supporting Republicans. They block, sabotage, mischaracterize and lie about about everything Democrats do (or try to do) to help workers because they don't want Obama to get credit for anything - And they say so! And many voters blame the Pres. So now there is an executive order to increase minimum wage for some federal workers. Republicans can't block it so they will lie about it and mischaracterize it... That is the way it works. More jobs has never been the intention of democrats. Shovel Ready was a joke from day one and everyone in CE knew it. There are only a handfull of states that actually are sitting around with unfunded construction projects. Now thanks to the POTUS those construction projects have been completed. Why do we allow people to run our country that have not worked one day in performing the tasks that they are to manage? For example when has their ever been a retired engineer that actually was placed into the position of Secretary of Transportation. They have all been mayors..or sentors...or some other mess. You get what you pay for....and this isnt what I paid for the Mayor of Charlotte has no idea how to run the USDOT! And this is coming from another African American. You hired based on prequals....not politics. Certified Professional Traffic Operations Eng. One of our nations largest eng firms has over 400 requisitions out for temp labor using high school students. All firms are "fishing" right now. Most are in negotiations or about to be in negotiations for contract work. If they win you may get hired. Chances are higher that you wont, as when work is won in one state it gets shipped via the internet to another office. Because the state in which the work was acquired doesnt have enough staff to do the work. Welcome to the electronic age. Will you fly to meet us? Of course, I will! Is your firm handling the flt details? LOL let me ask the hiring manager...NO! Newsflash: You will cater to you clients and take them out and spend 10's of thousands of dollars on them to get work from them ...tell me why your firm wont invest in its potential employees? Last time I checked a cost plus fixed fee contract or any other for that fact required quality staff to billout the hrs. So you have been out of work for over a year? No I started my own form to keep my skill sharp (both in eng and proj mangmt).... Oh so how is that working for you? (really what kinda damn question is that?) My firm is one of 5 black firms in the state of TN. Since it inception it has seen zero federal, state, or local dollars...enuff said? So you want to work for the oil and gas industry? Congradulations...you have an empressive resume...but you have no oil and gas experience. Okay so I need to go back to school for that, right? Yes and no...you actually need to work for a few years for an oil and gas company first....Really? Now how do I go about doing that...if I need experience but you wont hire because...you know what forget this!!!! On the international scene. Canada. Hmmm I have been working on getting a position in ON for the past 3 yrs (since I saw the market declining). Professional licensing is needed to get proper pay and position. I been in the Canadian licensing system for right at three years. They are saying I should be complete in another year..LMAO! Sir we would love to hire you but we are afraid if we do hire you that as soon as we do you will leave once someone offers you an engineering job. Sir you creditials are impressive. Why we understand that you can do this job well with no thought...We are not going to give it to you because (you fill in the damn blank)! Its the repubs who took over the house in 2010 promising jobs, jobs, jobs. They have not done one thing to improve the economy. All they have done is name post offices, and vote to take rights away from women. Then go home for their 4 days off and come back again doing the same thing. Couldn't be that prince reid will not bring up on a vote anything that is anti-communist or that king Obama does not approve of. Get real. Like what George ? ... I need examples. Reich is very right ... Demand creates jobs tax cuts don't. The middle class creates demand thus, creates jobs. I'm all for capitalism but, I understand how it works. Thus, I know that some things don't need a profit motive. You can have Obama Care or jobs. You can't have both. We need jobs a lot more than we need Obama Care. Figured it out yet? Why are Repubs so frightened of Obamacare? It is a Federal GIFT to Health Insurers. All Americans are required to have Health Insurance. If we do not get health Insurance from our Employers (for those of us who are not yet at POVERTY LEVEL), we must BUY IT. It is like the requirement that drivers purchase AUTOMOBILE INSURANCE. You have to have Health Insurance. If you are at POVERTY LEVEL, the Fed Gov will help you. If not, you must buy it. HEALTH INSURANCE CORPS will make MORE PROFITS! This is the FED GOV 'partnering with' & pushing money towards BIG BIZ = Republication Idea. It is not socialist. So why do Repubs act so agitated? Health Insurers will be the NEXT BANKSTERS! Can any of our leaders actually help America and the American People bounce back from all the stupid, traitorous, nonsense and damage done to the Real American Economy over the last 2-3 decades? No there is no help. we are screwed. Who'll the minstrel man get for the crony capitalist this time. Can't we be rid of this fool! Voters - This is what happens when you hire an amateur government with a hard ideology to do a grown-up job. You and your neighbor lost your jobs and your kids can't find any because of the government you elected. Yeah, I know it thrilling for your team to win and wonderful to listen to the cheerleaders, but this is real life of you and your country failing. If this were 2009 and we were talking about more than yet another campaign speech, I'd get excited. But its five years later and too late to change from "The Agenda" that yields "The Legacy" into helping private sector produce jobs. Voters, pay attention here - you and your neighbors lost their jobs and your kids couldn't find any because we hired an amateur government with a hard ideology to do a grown-up job. Yeah, I understand you want your team to win, but wouldn't it be better if your country - and YOU won? As for getting the economy moving faster... it's actually not that complicated. The economy is driven by having people who are consumers with more money to spend. The more they have to spend, the more goods and services they buy. That means the producers have to hire more people to provide the goods and services. They have to pay their new employees... who then spend their income. You create nice cycle where people have more money and spend it, thus letting businesses produce more and hire more people who will then spend more money. So... the answer is simple... you have to inject MONEY into the economy to make it grow faster then it would naturally. You can't tax to get that money (because that removes those dollars from the economy). You can't shift it from other programs (because that removes THOSE dollars from the economy). You have to BORROW it... preferably from another country. This takes the dollars out of their economy and shoves them into yours... temporarily. You can distribute that money by cutting taxes, or by putting in new spending programs. Doesn't really matter as long as you pay for it with debt. Economists generally believe that spending programs work better because the money goes to those who are more likely to spend 100% of it... things like unemployment insurance increases are a very widely accepted way to get dollars to those who will spend. the downside is that once the economy is humming along again... you have to either raise taxes or cut spending so that you can pay off the debt you incurred when the economy was bad. That's the part that our nation doesn't seem to know how to do. When we have surpluses we can't cut taxes... we should RAISE taxes and pay off the debt. The economy can afford to lose some dollars in those times. People seem to struggle with the macro-economics of the economy and how the government fits in. The government is not a household or business and they can't be run that way. In many ways, they should be run in the OPPOSITE manner. When times are good, the government shouldn't spend more money... they should CONTRACT spending, pay off debt and put off infrastructure improvements. They shouldn't return it to the tax payer, they should build some borrowing room for the next downturn. When that downturn hits, they shouldn't cut spending... they should ramp it up a TON. People always talk about how the war ended the great depression... and there's truth to that. But what a war is in economic terms is a gigantic government spending program. Planes, tanks, soldier salaries, medical supplies, ammo, guns, uniforms, parachutes, food for soldiers... all paid for by the government. You get the same (well actually a slightly better) economic impact by just buying food, clothes and providing government civillian jobs with the same expenditure... it's about the money being spent, not that it happened to be spent on a war. So... how do you create quicker jobs? The government should borrow and spend. But can we afford to do that given that we never work to pay off our debt once the times become good again? That's the problem we face... and that's why our growth is slow. In a normal interest rate and full employment environment, most of what you said is valid. However, the relationship between the markets for goods and services (private and government spending) and the market for money (supply and demand of money, loanable funds) when rates are near or at zero and unemployment are high significant dilute the impact of additional consumer or government spending (you have a larger crowding out effect). That is precisely why we've seen a relatively dovish fed policy and more extensive stimulus spending, yet very slow growth since 2008. Just like Japan 15 years ago when their low rate environment and real estate bubble burst, this recovery is likely going to continue to be slow. For all the spending prescribed in the 2009 stimulus, there wasn't a lot of bang for the buck because targeted spending crowded out recovery in other sectors. The same can be said for the relatively limited impact of bond purchases by the Fed. Despite material increases to the money supply over the past several years, GDP growth has remained slow because of the rate environment. There is not a simple answer to the recovery, we really just need to continue policies that help stave off a double-dip scenario and provide time for a more gradual recovery than those of the past. I don't know if I agree about the stimulus impact. The stimulus package was relatively small (about 800 billion when the lost spending impact of the dowturn was about 2.5 trillion). A chunk was also delayed as it was distributed as tax cuts (which wouldn't have an impact until the following year). Despite that, the argument has been made (by the Bureau of Labor Statistics, Moody's and IHS) argued that the stimulus was the major reason for the slowing of job losses (and eventual reversal of those losses). The stimulus wasn't large enough to spur huge growth. But it was large enough to arrest the negative economic movement. The issue was the size... we replaced 2.5 trillion of spending lost through the recession with a 800 billion dollar shot. While that helped, it was never going to be enough to cause a quick bounce back. Just enough to stop the decline. You know it's January when Barack "Jimmy Carter 2.0" Obama leaves the golf courses to go out there and give his annual "I'm going to have a laser-like focus on jobs, trust me!" In January of 2009 (when Obama came in) there were 142.1 million people employed in The US. For december, the number was 144.5 (seasonally adjusted). That means there are 2.4 million more jobs now then when Obama took office. Non-seasonally adjusted it's 140.4 and 143.9... or 3.5 million more jobs. By comparison, in Bush's 8 years he added 4.4 or 4.0 million jobs in his 8 years depending on which measure you use. Of course, that doesn't account for the growth of the work force, which is why the unemployment rate isn't good. Also... it's important to note that the decline in employment was hitting at its hardest right when Obama was coming into office. If you look at the employment numbers since January of 2010 (1 year into his presidency), you'll see the increase is 6 million jobs. All of the losses happened in the first year, when he was supposedly "righting the ship" from his predecessor. 6 million jobs added in 4 years isn't superb... but it's not bad either. It's a slow and steady jobs growth when we really could use explosive growth. But you don't get explosive growth without injecting money into the economy, and congress (and Obama too to a lesser extent) have been unwilling to take on the debt necessary to make a huge injection like that. So we're stuck with slow and steady. Davis says, "Minnesota needs new leadership and we must hold the line on taxes". Our economic problems didn't happen overnight. It's been happening over the last 25 years, but the economy was kept going by middle class Americans tapping into the equity on their homes until they were completely tapped out. This all occurred because for the past 2-3 decades, our government has allowed our country's industries to get sucked out to China, India, Mexico, etc and allowed illegal aliens and H-1B foreigners to come into our country and take away tax-paying Americans jobs and drive down prices and wages. It's time that we become the unsilent majority. prevent recovery by putting money into the hands of other people than the Koch's, they pay for libertarians and republicans.